When it comes to finding Persian oriental rugs for sale, the trip from Brookline to Shrewsbury is well worth the drive. Located just off of Route 9, our oriental rug gallery is one of the largest in the area. We offer Brookline residents hundreds of rug options at competitive prices. We understand that in order to make your house feel like a home, an oriental rug is often what brings the look and feel of a room together. 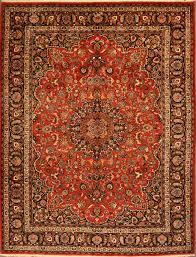 Not only do we sell and repair oriental rugs for Brookline residents, but we also provide cleaning services. Cleaning and restoring your oriental rug is important to ensure the rug’s longevity. If you have an antique rug, it is especially important to keep your rug clean and in good condition if you plan on passing it on to family members. Our professional rug cleaners use gentle rug cleansers that reach deep down into the fibers of the rug without damaging the color or material itself. Moths are often common in homes around Brookline, which is why we also offer oriental rug mothproofing as a way to protect your rug from these pests. For more information about our rug cleaning, rug restoration, or mothproofing services, contact us online. Interested in shopping for an oriental rug? Check out our online selection!